Mobile commerce represents a significant opportunity – 90% of Americans own a cell-phone but only 7% of them have conducted a transaction on their phone, according to Nielsen. This, despite technology that makes it increasingly easy to buy goods on your phone: we tested one company’s offerings on our phone and it was surprisingly straightforward with minimal steps. Revenue growth spiked beginning in mid-2009 for retailers with mobile offerings. Smaller retailers are now helping drive industry growth in addition to the largest ones. Near Field Communications could enable the industry to scale to ubiquity, but all the stakeholders need to support this and we’re likely years from that happening. After years of unrealized astronomical forecasts, the mobile commerce market started to take off near the end of Q109 and gained steam throughout the summer. 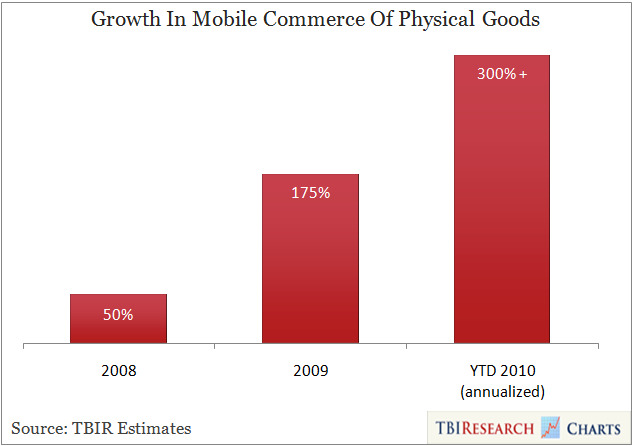 We estimate mobile commerce grew about 150% to 200% in 2009 (albeit off a very small base) and has experienced accelerated growth during the beginning of 2010. Retailers started spending more on mobile operations after a long period of holding back on capital investments during a prolonged recession. Significant press about the industry and buzz surrounding new products raised consumer awareness (Apple profiled a mobile commerce app in a major TV advertising campaign during the beginning of 2009). In addition, it appears the size of the buys on mobile phones rival those of e-commerce purchases on PCs. Apparel orders have averaged $75 to $100 for many retailers, with gifts (a popular spontaneous mobile purchase) averaging as high as $35 to $40 an order. This is an encouraging step toward mass-market adoption since it indicates consumers are comfortable making significant purchases on their phones — a necessity if the industry is going to approach revenue levels of PC-based e-commerce. Given the necessary investment in technology coupled with the infancy of the market, large well-capitalised retailers have been most active in the space to date, according to Todd Ablowitz, president of consulting firm Double Diamond Group. For example, last year Amazon and eBay accounted for about 70% of all physical goods sold on mobile phones. However, private third-party service companies are enabling smaller retailers to launch mobile e-commerce sites and accept mobile payments for goods and services. Private companies like Digby, innerfence, and Billing Revolution are the most active in this space. Smaller retailers from 1-800-Flowers, ESPN, Toys R Us, to mechanics and contractors have used third-party companies like these to enable mobile commerce. We estimate mobile has become about 2% to 5% of total revenue for many of these small-to-mid-sized retailers, with some of the larger ones currently generating 8-figure revenue levels from mobile. Near Field Communications (NFC) is a high-frequency, short-range wireless technology that runs on unlicensed 13.56 MHz spectrum and enables the exchange of data among devices within four inches of each other (think those fobs that Mobil provides customers with to buy gas by simply placing the fob near the pump). Mobile phones can access this frequency with an additional antenna and some updates to their SIM cards. 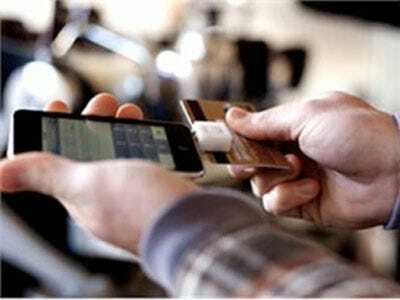 At that point mobile phone users will be able to transact with vendors with point-of-sale (POS) systems that are compatible with NFC without having to supply any credit card or other associated info, which will be stored on their phones. Mobile operators in Asia have used this and similar frequencies to drive mobile payment initiatives in recent years, but Sarah Clark, analyst and author of the report “NFC: The Road to Commercial Deployment,” points out that a lack of uniformity from carriers to vendors has prevented this from accelerating in the US. For example, in the past year U.S. carriers have been discussing ways to work together to drive the initiative, but talks so far have not amounted to much. This is because the market is too small currently for an individual carrier to take the risk of spending money to subsidise the development of the technology only to see its competitors hop on board when the industry is more advanced, or see a new technology emerge with a better solution (unlikely given scarcity of spectrum, in our opinion). Stakeholders will need to come to a consensus and work together to support development or one company must go it alone. We think the latter is unlikely at this stage. In the meantime, start-ups that offer alternatives to face-to-face wireless commerce technology like NFC will drive this market initially.